Brunei has few civil society organisations (CSOs) and non-governmental organisations (NGOs). 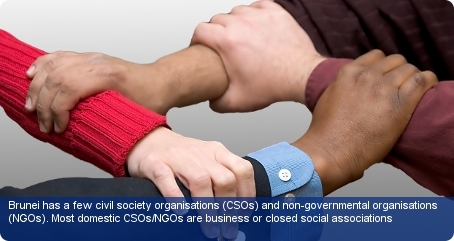 Most domestic CSOs/NGOs are business or closed social associations, including international CSOs such as Rotary, Kiwanis, and the Lions, which developed out of the established business community. Brunei Darussalam AIDS Council is perhaps more notable in terms of its wider open participation. The Brunei Darussalam AIDS Council was established in 2000 to assist in educating and creating awareness about HIV/AIDS. The council oversees its sub-organisation Kelab Penyinar, which specifically concentrates its awareness efforts on the youth. Any NGO seeking to operate in Brunei is required to apply for permission under the Companies Act. The company must comply with the fact it is only formed for ‘promoting commerce, art, science, religion or charity’ for the company to fully exist. Union activity in Brunei is scarce as there is no legal basis for collective bargaining or strikes. Should a trade union wish to be created, they must be registered with the government and authorised by the Trade Union Act of 1961. Today, there are only a minimal number of trade unions registered in the country.